For Bellandur, Varthur, Pattandur and the other dying lakes of Bengaluru, Hebbagodi has a lesson or two on lake conservation. Bengaluru: The lakes of Bengaluru may get a new life again. Lake conservationists in the city are delighted as rejuvenation of the Hebbagodi Lake in the IT hub of the city hold out hope for other waterbodies in the city. For Bellandur, Varthur, Pattandur and other city lakes, which have been in the headlines for frothing and catching fire, Hebbagodi has a lesson or two on how a lake can get a new lease of life. 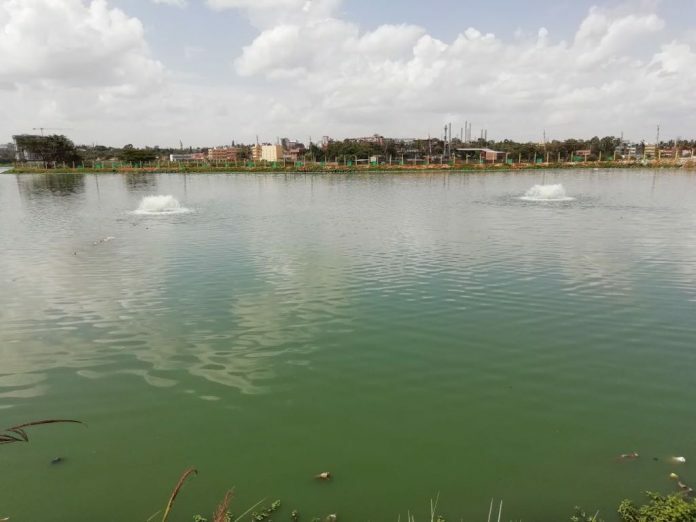 Located on Hosur Road, near Electronics City in southeast Bengaluru, the Hebbagodi Lake is a 35-acre water body that was on its ‘deathbed’. Uninterrupted construction, the lure of a lake view apartment and dumping of garbage choked the water body. It reached a point where the stench from the lake was unbearable and the industrial waste that was being dumped in it contaminated the water, a source of drinking water for the nearby villages. Residents, lake activists and private establishments of the area hoped against hope and managed to restore the lake. In 2014, the local residents decided to take up the matter of the dying lake with the civic authorities but all they got was paperwork. Unable to bear the stench and contamination, the residents decided to take up the cause on their own. Several attempts were made by resident associations and lake protection groups to collaborate with the civic bodies, but with little success. However, in 2016, a workshop was held by the now-defunct government body, Karnataka Lake Conservation and Development Authority (KLCDA). The workshop involved many IT giants of Electronics City, and it was here that five companies — including Biocon, Wipro and the UB Group — formally signed an ‘expression of interest’ (EOI). It was decided that the companies will individually take up lakes for rejuvenation and maintenance — Hebbagodi (Biocon), Maragondanahalli (Wipro), Bommanahalli (UB group), Mahadevapura (Mphasis), among others. An active participant in the restoration of Hebbagodi, Biocon Foundation, the pharma company’s CSR wing, said it used three different technologies to clean up the lake. The first one is called bio-remediation — dousing of enzymes. The second one is called floating wetlands, where plants are laid out on a wooden or lightweight frame and they float around the river. These plants have a unique property of being able to absorb harmful chemical constituents and generate nutrients. The third one is called aeration, which includes putting up filters in the lake to increase the oxygen levels. Pratima Rao, the mission director of Biocon Foundation, said all three technologies were used for the restoration of the Hebbagodi Lake. “This lake had sewage coming in and two storm water inlets and loads of construction material which were lodged in the bed with the weeds growing on them. We had done a detailed videography to capture the condition of the lake and we found that there was a lot of garbage on the lake bund and heavy infestation of weeds which posed a huge problem,” Rao said. With heavy pollutants and chemicals, the effect of the oxygen levels gets negated, killing all forms of life leading to rotting of vegetation in the lake. That leads to stench and emission of poisonous chemical gases, which, in the worst circumstances, could lead to the lake catching fire. The increasing levels of oxygen indicate that the water contamination has reduced and aquatic life can be revived. “It is a continuous process, monitoring each day how the water is treated and let into the river. We monitored the garbage dumping and flow of sewage water into the lake on a regular basis. The lakes had a lot of industrial waste, building material and garbage dumped in it. The inlets were cleaned and conduits were set up,” Athri added. Biocon even involved its employees to lend a hand. “It was like a mission for all us. In order to create a floating wetland, we needed plastic bottles which would float with the plants. By creating a mesh and putting these plants, we were able to create a floating wetland which in turn helped absorb the chemicals and increase the oxygen levels,” Rao said. Kiran Mazumdar Shaw, Biocon’s chairman and managing director, expressed her admiration for the months of work put into restoring the lake by her team along with others. “Hebbagodi Lake has been revived due to a great community spirit led by Wg Cdr Athri who worked tirelessly with Biocon Foundation to rescue a dying lake and make it breathe again,” Shaw tweeted Saturday. With the restoration of the Hebbagodi Lake, the path to revival of other Bengaluru lakes is a lot clearer. What it requires is commitment from the stakeholders. Biocon and Athri are already armed with their next project — to revive the Kammasandra and Bommasandra lakes – even as they hope that the citizens of Bengaluru concentrate on the lakes near them. The future of the city lakes, like Bellandur, which have been poisoned by industrial and domestic effluents, may not be as bleak as it appears after all. Kiran Mazumdar Shaw, Biocon’s chairman and managing director, is an investor in ThePrint. We were made to read the achievement of Biocon in restoration of Hebbagodi Lake. It was a part of our development communication course to read upon articles that revolve around civic concern. And half of the class wasn’t aware of such an initiative being taken. It came across as a surprise to us and also encouraged us to be active participants. On reading such stories, you understand that there is nothing you cannot do , if you have the will to. Biocon may have had an upper hand in this case, but civic concern and urge to make things right lead to such a moment. And as a responsible citizen, I believe that I can do the meagre task of appreciating and acknowledging the efforts of those who want to make a change. There is no quick fix for Bengaluru’s lake problem. While complications in ownership, maintenance responsibilities, and citizen powers shove a wrench in lake development plans, an awakened citizenry is proving to be the catalyst for change. The Hebbagodi Lake project is an inspiration for the people who wish to revive other dead lakes in Bangalore . It’s not impossible to make the city , the city of lakes once again . Many other lakes are in severe condition and want our attention too. This is a great initiative by biocon . Using technology and science in a proper manner. If we keep on preserving the existing resources like this we won’t regret later. The Hebbagodi lake has set an example for other lakes in the city to follow suit. Hope something good comes out of this venture and serves as an inspiration for private entities as well as the govt bodies to pitch in and help the dying, natural treasures of Bengaluru. How heartening it is to read a good news .All concerned need to be thanked for showing us a way .They should be congratulated and honoured .We have the people.We have the talent . The spark is there ;it only has to be preserved and nurtured.These events should fill the pages of our newspapers and become subjects of our television discourse.The Industry must take the lead in philanthropy; but the Governments should be proactive too. 1 plus 1 makes 11.